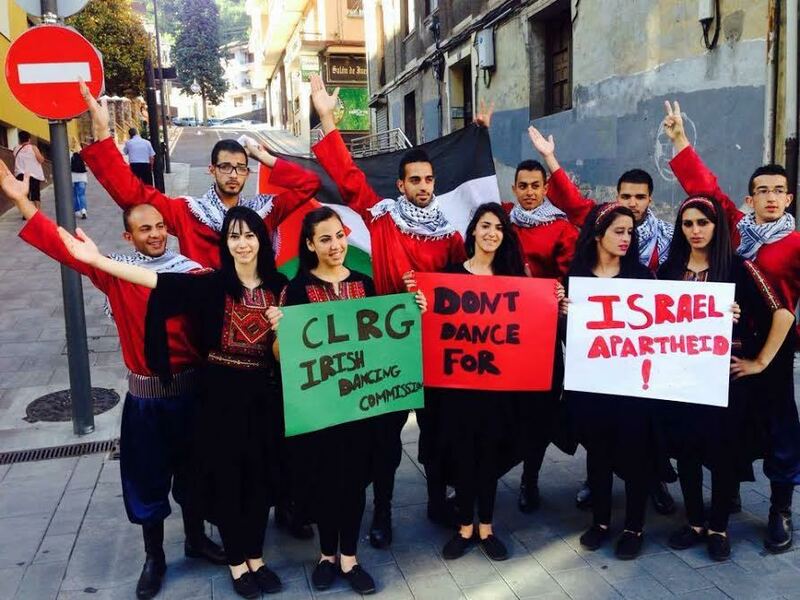 We are reproducing this long post from the Ireland-Palestine Solidarity Campaign in which they refute allegations that threats and danger to dance students brought about the cancellation of the first Israeli Irish Dance Feis, planned for Tel Aviv in August. The piece explains the goals and tactics of this particular cultural boyott campaign and in the process explores the principles of applying BDS in the arts. There is much more on this subject on the website of Artists for Palestine UK. According to a post on the Facebook page of the Carey Academy in Israel and The Carey Academy of Irish Dancing in Birmingham, the Israeli Irish Dancing Feis scheduled to take place in Tel Aviv on August 15th has been cancelled. The post announcing the cancellation makes scurrilous and defamatory remarks against human rights activists and organisations*. In 2005 over 200 Palestinian civil society, trade union, faith and artistic groups called for a comprehensive boycott, including a cultural boycott, of Israel and Israeli institutions until Israel ends its occupation of Palestinian lands and abides fully by its commitments under international law. As supporters of this call based in Ireland, the IPSC welcomes the cancellation of the Israeli Feis as it represents the cancellation of an event that – consciously nor not – sought to ‘greenwash’ Israeli human rights abuses, war crimes and international law violations by bringing international cultural figures to Israel. However, it is important to clarify from the outset that the Ireland-Palestine Solidarity Campaign – in accordance with the Palestinian guidelines for the Cultural Boycott of Israel – never sought the cancellation of the Feis. Instead we sought to encourage Irish people who had planned on attending the competition – including the advertised adjudicators Seamus and Ainé Ó Sé – to boycott the event in solidarity with Palestinians living under Israeli occupation and Apartheid. Separately, we pleaded with An Coimisiun Le Rinci Gaelacha (CLRG; The Irish Dancing Commission), as an organisation which receives money from the Irish taxpayer via Conradh Na Gaeilge, to withdraw its endorsement, promotion and support for the event taking place under its auspices. In other words, if Israelis in Israel want to host and partake in an Irish dancing competition – or any other cultural activity – this does not fall within the guidelines for the cultural boycott. An event only becomes subject to a call for a cultural boycott when international artists, cultural figures or institutions are asked to take, or listed as taking, part. This was very much the case with the Israeli Feis which not only involved international (Irish) adjudicators, a musician from Birmingham in England (who subsequently withdrew from the event), was endorsed and promoted by the CLRG and included an open call to Irish dancers from all over the world to attend. Thus it met the criteria to be focused on by principled human rights activists acting in solidarity with the Palestinian people. That culture and the fight against oppression are inextricably linked is recognised by the more than 500 Irish creative and performing artists that have already signed up to the Irish Artists’ Pledge to Boycott Israel. These artists join a growing list of international artists like Roger Waters, Lauryn Hill, Ken Loach, Mira Nair, Nigel Kennedy, Cat Power and Elvis Costello who have refused to perform in Israel as an act of solidarity with the occupied and besieged Palestinian people. Famed anti-Apartheid activist Archbishop Desmond Tutu said last year that the conflict’s solution will “come from that nonviolent toolbox we developed in South Africa in the 1980s, to persuade the government of the necessity of altering its policies. The reason these tools – boycott, sanctions and divestment – ultimately proved effective was because they had a critical mass of support”. The Carey Academy announcement states that their page “started to be attacked” – by which they presumably mean people were leaving comments in support of Palestinian human rights and the cultural boycott campaign – by a “radical political group” – by which they mean the Ireland-Palestine Solidarity Campaign (IPSC), an organisation that supports Palestinian human rights and the Boycott, Divestment and Sanctions (BDS) campaign. The post further states that the IPSC is “led by” Raymond Deane, Kevin Squires and Amanda Crawford. Ms. Crawford is a member of the Irish Palestinian Activists Collective, and not a member of the IPSC. Mr. Deane is a former Cultural Liaison Officer of the IPSC. Mr. Squires is a part-time employee of the IPSC. The post insinuates that the IPSC – or these individuals – sent “threatening messages” to “teachers, parents and students”. Leaving aside the near impossibility, were one even so inclined, of finding contact details for teachers, parents and students which are presumably only in the hands of organisers, this is a completely defamatory statement. Neither the IPSC nor anyone officially associated with it sent a single threatening message to anyone. This statement smells of the usual lies and hasbara (Israeli propaganda) spewed forth when human rights activists are campaigning in favour of a cultural boycott. We routinely hear of “threats” by the IPSC yet evidence has never been produced by any accuser to back up such defamatory claims. Indeed, it is not the first nor will it be the last time such lies are told about the IPSC. They are par for the course when campaigning against Israeli apartheid and for Palestinian human rights. If such an incident has occurred, it is of course important to state that IPSC neither advocates nor stands behind any violent act or violent threat made in the name of the BDS movement – nor does the international BDS movement itself – and that if anyone has genuinely made such statements or engaged in such actions they represent themselves only. Yet, we are surely not alone in suspecting that having been taken to task by international human rights activists and realising the increasing indefensibility of their position and having their name and reputation associated with Israeli apartheid, The Carey Academy decided to pull the plug on the event, but sought to insinuate that non-existent threats of violence were the rationale. Meanwhile, very real threats and racist comments have already started appearing in the IPSC mailbox and on our social media pages. For the record, it is important to chronicle just what actions the Ireland-Palestine Solidarity Campaign took during the course of this short campaign. On 17th June we wrote privately to Aine and Seamus Ó Sé and asked them not to take part in the Feis. We received no response to this letter. We subsequently wrote again to Seamus Ó Sé – this time via email – when we had been made aware by a third party that Mr. Ó Sé was circulating false statements about the IPSC. In this letter we informed him that as “you have indicated in the email to Ms. Ni Bhriain (though, it must be pointed out, not to us) that nothing will change your mind on this issue it seems there is little point in continuing a dialogue with you and your partner as individuals who have chosen to break the boycott. It is heartbreaking that you would choose to ignore the calls from Palestinian civil society, from Palestinian dancers, musicians, singers, artists, writers, musicians, poets, human rights activists and everyday people not to help whitewash their oppression by the Israeli state, but ultimately the choice is yours alone to make.” Once again, we received no response to this email. On 18th June we wrote privately to the CLRG and asked them to cease their endorsement, promotion and support for the Israeli Feis. We received no response to this letter. On 19th June the IPSC was contacted by Colin Coyle of the Sunday Times, who was of the belief that the “social media campaign” was being organised by the IPSC. Mr Coyle was told that it wasnot an IPSC campaign, but that the petition was set up by the Irish Palestinian Activists Collective. The IPSC subsequently sent a statement to the Sunday Times, but despite this the printed article claimed the social media campaign was being organised by the IPSC. The journalist was immediately contacted and this erroneous statement was corrected in the online edition. A number of letters then appeared in the following week’s edition of that paper which named the IPSC. A right of reply was sought but, alas, not granted by the paper. The same statement that was issued to the Sunday Times was also sent, upon request, to the website Irish Central and was quoted in full in this piece. On 25th June, on behalf of the Israel citizens’ group Boycott From Within, we sent a letter to the CLRG calling on them to support the cultural boycott and posted the letter on our website at their request. To the best of our knowledge, BFW did not receive a response to their letter. On 29th June we posted a statement that had been emailed to us from Jewish Voice for a Just Peace (Ireland) calling for a boycott of the Israeli Feis on our website. 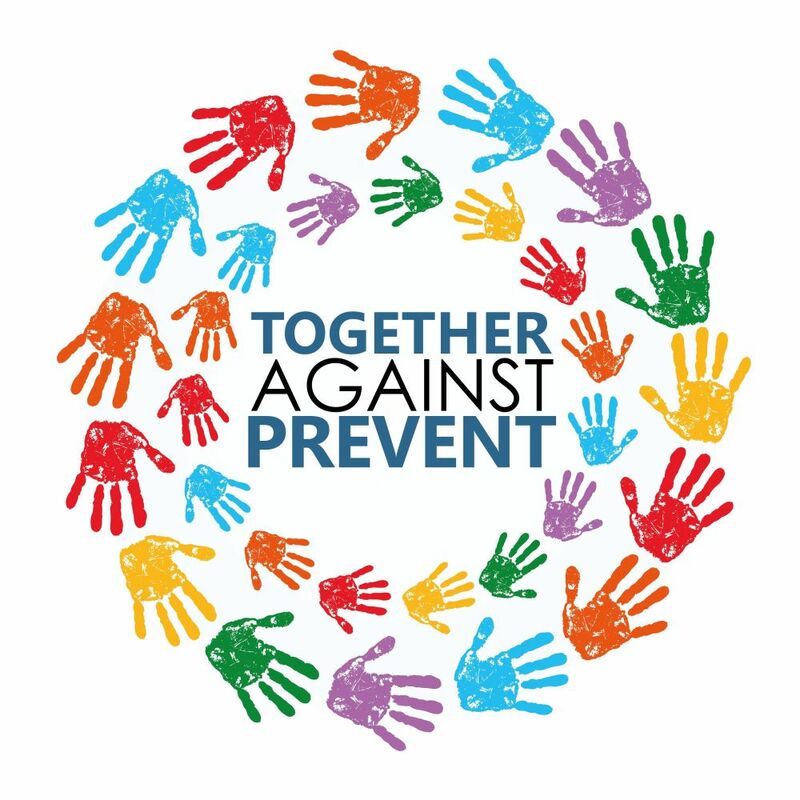 Several times over the course of four weeks on our social media sites we shared the petition created by the Irish Palestinian Activists Collective and asked people to sign it, and on 6th July we shared their call for a Twitter Thunderclap. Finally, we shared images of Palestinians calling for a boycott of the event. This is the sum total of the actions taken by the Ireland-Palestine Solidarity Campaign during this campaign. 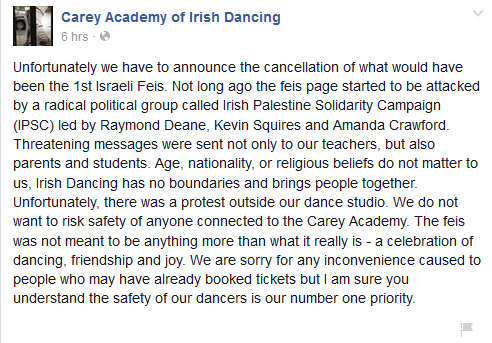 To return to the Carey Academy statement, it claims that “unfortunately, there was a protest outside our dance studio. We do not want to risk the safety of anyone connected to the Carey Academy”. 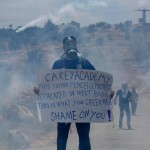 By this they mean the Carey Academy in Birmingham, England – not their Israeli branch. People have a right to peaceful protest and judging by the complete lack of any evidence to contrary it seems this protest was entirely peaceful in nature. With the growth of the global BDS movement over the past ten years, institutions that do business with Israel – whether financial, cultural or otherwise – should expect protests from people concerned at these associations. This is what happens in democratic societies. The outrageous insinuation that dancers, or anyone else associated with the Academy, were ever in physical danger is simply a barefaced lie. However, this protest in Birmingham was not organised by the IPSC – as the Carey Academy is located in England, it is outside of our ‘jurisdiction’. For the IPSC to organise a protest in England would be akin to our colleagues in the British PSC organising an action in Cork. Indeed, as the Carey Academy is based and located in England, we never saw it as our role to focus on their involvement with the Feis, preferring to leave that to local activists – we focus on trying to convince Irish cultural figures to join the more than five hundred of their peers in respecting the Palestinian call for a cultural boycott of Israel. Further, the Carey Academy states that “age, nationality or religious beliefs do not matter to us, Irish Dancing has no boundaries and brings people together.” This seemingly liberal and worthy statement elides at least one very major fact – Israel is a racist state that operates a racist entry law. Therefore any event that takes place in Israel automatically excludes millions of Palestinian refugee families who are denied their UN-mandated right of return to the homes they were expelled from in 1948 and 1967. Israeli also operates a severely restrictive entry regime for Palestinians from the territories it has occupied since 1967. This reality exists alongside the ‘Law of Return’ under which anyone of Jewish ancestry anywhere in the world can claim Israeli citizenship. The Israeli state openly discriminates on the basis of “nationality [and] religious beliefs”, therefore any event held in that state will also be discriminatory on the same basis. Yet, while it may be true that the Israeli government was not directly involved in the Feis, the Palestinian call for a cultural boycott of Israel is predicated on the fact that the Israel state routinely uses culture as a tool to normalise and whitewash its decades of human rights abuses, war crimes, occupation and apartheid policies. As the Director-General of the Israeli Ministry of Foreign Affairs said in 2005, for Israel “culture is a propaganda tool of the first rank, and I do not differentiate between propaganda and culture.” Another Israeli foreign office official, Arye Mekel, remarked that culture was way of “show[ing] Israel’s prettier face, so we are not thought of purely in the context of war” and occupation. Israel is a frequent and flagrant violator of international law and human rights norms, and regularly commits war crimes. Just last year in a brutal assault on Gaza, Israel killed over 2,200 Palestinians, the vast majority of them civilians, including more than 500 children. In a human rights report following this attack, Defence for Children International said that it “found overwhelming and repeated evidence of international humanitarian law violations committed by Israeli forces. These included direct attacks on children, and indiscriminate and disproportionate attacks on civilian homes [and] schools”. Therefore, whatever the intentions of the organisers, or those who were willing to take part, they were in effect providing cultural cover for the Israeli state’s horrendous treatment of the Palestinian people. Indeed, the Israeli Embassy in Ireland mentioned the Feis, and even posted some of the anti-Palestinian, anti-BDS letters that appeared in the Sunday Times on its Facebook and Twitter pages. One post was subsequently shared by the ‘1st Israeli Feis’ event page, operated by the Carey Academy – certainly strange behaviour for an organisation that insinuates its own opposition to the actions of the Israeli government as it did on 19th June. Finally, as part of the Feis, the Carey Academy were offering participants “a bus tour to some incredible place in Israel … will be chosen according to your votes”. The very first option is a tour of “Jerusalem (Old City)” and the second is “A Tour of Three Religions in Jerusalem”. Of course the Old City of Jerusalem is in illegally annexed Israeli-occupied Palestinian East Jerusalem, and no “three religions” tour would be possible without visiting the Old City. Thus, we see the Carey Academy, whether wittingly or unwittingly it does not matter, reinforcing the Israeli state narrative of East Jerusalem being part of Israel, when no country in the world (other than Israel) recognises it as such. This entry was posted in cultural boycott, ireland, irish dance, israel, palestine, raymond deane. Bookmark the permalink.